Browsing articles in "Senza categoria"
SONO APERTE LE ISCRIZIONI AL CORSO PER ESECUTORE B.L.S.D. IL CORSO SI TERRA’ A CASARANO PRESSO LA SEDE DELLA CROCE ROSSA 118. 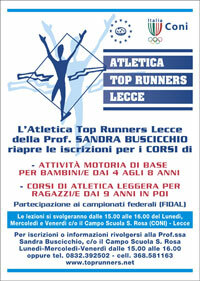 IL 29 MAGGIO DALLE ORE 15,45 ALLE ORE 20,00. QUOTA €20,00 DA CONSEGNARE ENTRO IL 24 MAGGIO c/0 LA SEDE M.S.P.I. LECCE in Via Balsamo 11. per info 368581163. MAX 15 POSTI.